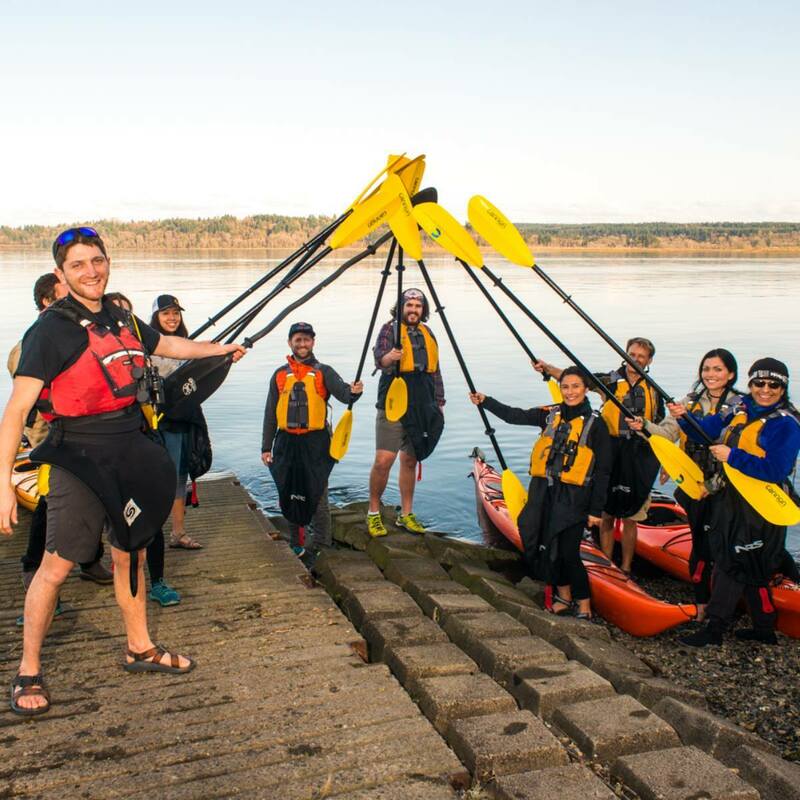 Sam’s small business has grown exponentially and Kayak Nisqually Puget Sound Adventures has become a fixture in our community introducing a variety of different people to the water. Most recently, Sam has added a handful of assistants to his crew so he is able to take out larger groups and it’s been met with great success. A local church group of forty middle-school aged girls booked Sam for an all-day tour complete with a trip across the sound and a nature hike. Of course he had help, but that many teenage girls might be enough to scare most people away, but as Sam explains, it was just another great experience. “We had a few things come up, but I’m always prepared for anything,” he says. That’s just how Sam does things. His easy nature makes everyone comfortable even when they are trying something for the first time. “For a lot of these girls it was something they had never done before,” Sam says, “so it showed them they could do something like this, even if they were a little scared at first. They came away from it feeling a lot more confident.” Because the guides are not in the actual boat it’s an experience that forces people to rely on themselves and find their inner strength, whether they want to or not. Of course, that’s all part of the fun. “We had such a wonderful time, I got really great feedback and I think everyone greatly enjoyed themselves,” he adds. However, not everyone gets to come out with forty of their friends, and at Kayak Nisqually Puget Sound Adventures that’s ok too. It’s a great experience, whether solo or as a couple. “It’s a perfect first date because you have to work together and you end up finding out a ton about each other,” Sam says. “There’s really not much escaping once you are in a boat having to work as a team.” Now if you’re cruising solo for a kayak trip it’s also an easy way to meet people with similar interests and Sam is happy to pair people up. One aspect of Sam’s company that seems to have found quite a following is his bioluminescence tours. “These trips fill up really fast,” he comments. “I wish I had more boats so I could take out more people because we are limited as to when they are available.” These evening kayak tours revolve around the chemical reaction that produces light energy that our marine life then give off during specific seasons. It’s like paddling through a glowing field of stars. Because they have become so popular it’s important to book well in advance to make sure you get a spot. However, don’t worry if your summer is filling up fast and you still haven’t gotten out on the water. Sam says the off-season is still a perfect time for a tour and he’s more than prepared. “Summer is amazing, but the winters actually have really incredible wildlife, especially for birds and we have all the gear to keep you comfortable,” he adds. And be prepared for Sam’s vast array of knowledge about them. 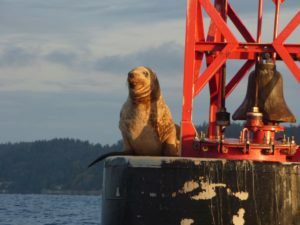 With a biology degree from The Evergreen State College, every one of his tours comes with an added lesson about the unique marine and animal life around us. 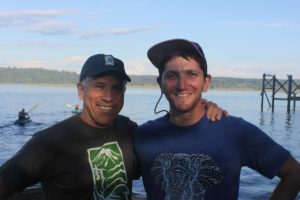 Because Sam has such a strong connection to the Puget Sound area it’s no wonder he spends a lot of his time volunteering with numerous organizations that help make it a better place. From the Nisqually Reach Nature Center, where he acts as the caretaker, to the Olympia Free Clinic, Sam is always willing to donate his time or a tour. “It’s important for us to make money of course too, but it’s also very important to give back to the community however we can,” he explains. So if you’re one of the few who hasn’t taken one of Sam’s unique tours, it’s definitely time to see what you have been missing. Grab some friends or just yourself and head out because you might just find exactly what you’ve been looking for. 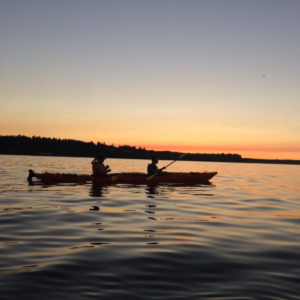 To book a tour with Sam visit Kayak Nisqually Puget Sound Adventures.